Living in the US, fall/autumn seasonal recipes that come to mind usually has pumpkin, baking, and all variety of comfort dishes. However, my first craving for fall dishes are actually fish, mushroom, and chestnut. 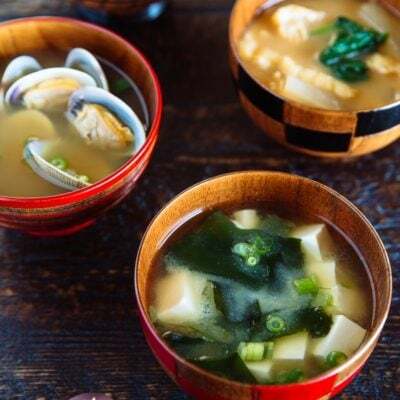 You might think it’s a bit strange, but these are a few from many autumn ingredients that Japanese look forward to as the temperature started to drop and air in the evening gets crisp. Sanma (秋刀魚) or Pacific Saury is fish that becomes available in fall, and literary means “autumn sword fish” in reference to sanma season and its body shape resembling a sword. 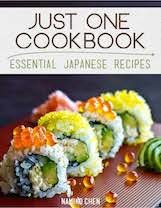 As you know, the Japanese eat fish raw for sushi and sashimi; therefore, fish in Japan is generally very fresh. In order to enjoy the fundamental quality of the fresh fish itself, the most common preparation of fish is to sprinkle salt and grill. 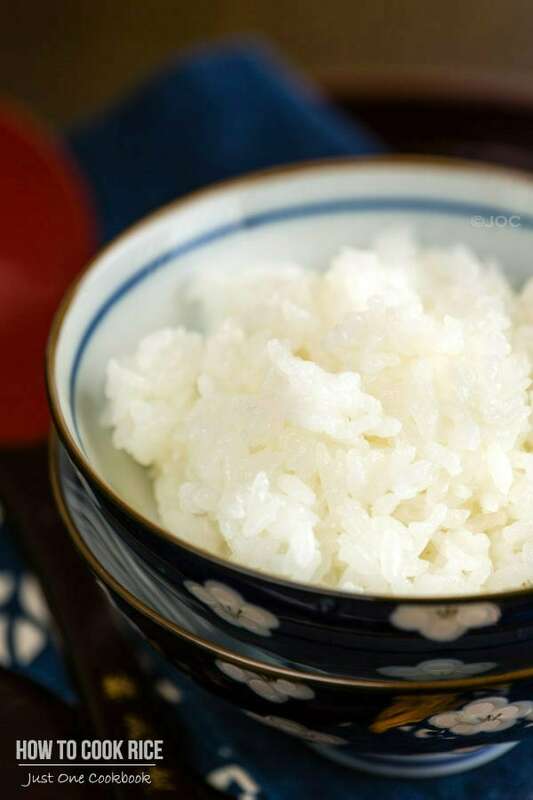 We call it Shioyaki (塩焼き) – shio means salt and yaki means grilled. 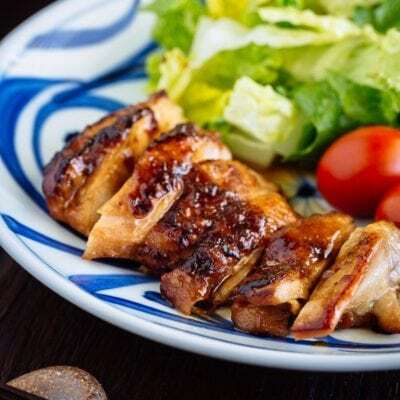 Now you start to recognize the menus from Japanese restaurants such as Saba Shioyaki (Salt-Grilled Mackerel), Salmon Shioyaki, and so on. 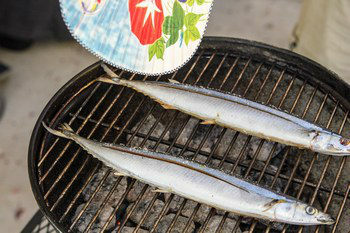 One unique feature about preparation for sanma is that it is usually grilled whole with the head and guts intact. 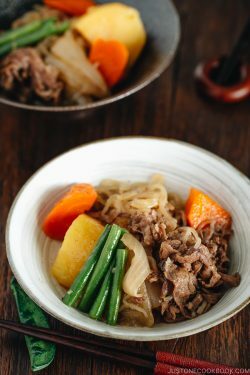 This highly nutritious gut part is very bitter, but some Japanese actually eat the guts. Last year I shared Sanma Shioyaki recipe but I broiled in the oven toaster. Since my husband mastered in charcoal grilling over the summer (see our BBQ recipes), we actually charcoal grilled this fish for the first time, just like how some of Japanese restaurants cook their grilled dishes over charcoal. The smokiness from the charcoal added another layer of flavor to the dish and it was AMAZING! Just in case you wonder how we eat this fish, I’ll quickly go over. The fish is usually served with grated daikon radish and a wedge of lemon (usually we use sudachi). 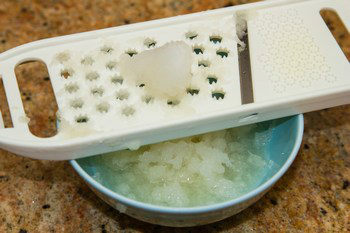 Pour a dash of soy sauce over grated daikon. Squeeze lemon/sudashi all over the fish. Place the daikon (now soaked in soy sauce) on top of the fish. Use your chopsticks to dissect the the fish by spreading the fish from center where it’s scored. Place the fish and daikon together in mouth. Hmmm! Delicious! I love fall. 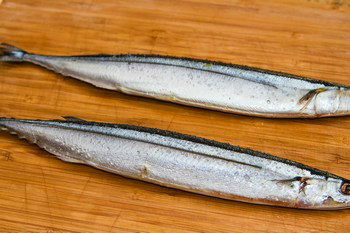 Sanma can be found in most of Japanese supermarkets this season. Enjoy! Rinse the fish in cold running water and pat dry. Sprinkle sea salt on both side of fish. Set aside for 10 minutes. This will dehydrate the fish. 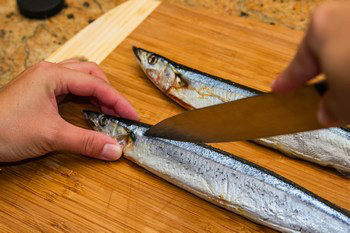 To avoid the fish skin bursting during grilling, insert a sharp knife next to the gill and score lengthwise (see below). The fish has a line running across its body where you need to score so just follow that line. 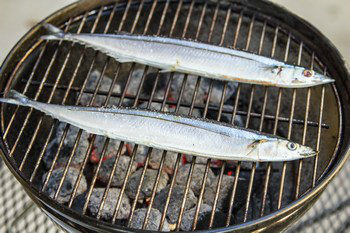 Place the sanma on the grill. Face down the side that is going to be showing when you serve. Grill about 8-10 minutes each side. Grill over strong heat but no flame. When charcoal gets too hot and the fish is about to catch fire, sprinkle some water on the flame so the fish doesn’t get burnt. This is common since Sanma is fatty. Around 8-10 minutes, the eye turns white, and that’s the sign it’s cooked. Flip the fish carefully just once. Grill the other side for 8-10 minutes and serve on a plate. 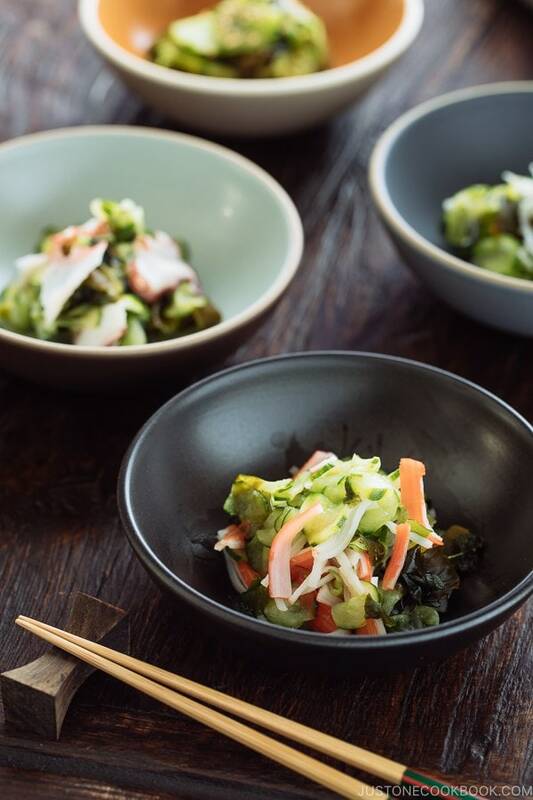 Right before you serve, grate daikon. Squeeze liquid out gently and serve next to lemon wedges. 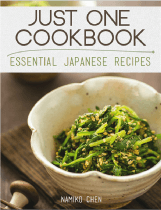 Pour soy sauce over the grated daikon and place it on top of fish to eat together. For non-charcoal grilled recipe, click here. Hi Lan! That is a good question, and answer is yes. When I was small, I didn’t eat it. I became to enjoy this part as I grew up. When we say “guts”, it sounds bad and disgusting (for some maybe), but if you eat with lots of grated daikon (with soy sauce), it’s actually enjoyable and I see why a lot of people do eat this part. And it’s fully cooked and I don’t normally eat guts etc. Thanks for sharing another simple recipe. I’ve seen this fish in asian markets and have always wondered how to cook it. Hi Candice! Sanma season is very short, so I’m going to enjoy this fish as much as I can. 🙂 I think this dish is popular in Asian countries too. Beautiful, Nami! I can just imagine the smoky flavor! It’s exactly how we grill the fish here, just salt but minus the guts. 🙂 I think I’ll pass that. And I love soy sauce (with lemon) as dipping sauce for grilled fish! Yum! I’m curious to try the gut! What about fish bones though? Do you eat those too? That looks so good. Easy breezy recipe. 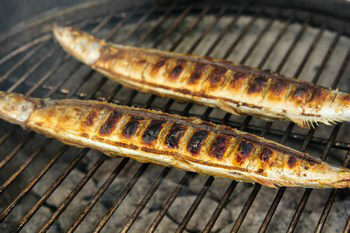 I grill mackerel with Indian spices and that’s one of the quickest meal I enjoy these days. I’ve never heard of this fish Nami, or in fact about the novelty of eating it with guts! However, having grown up eating grilled and smoked eel, mackerel, perch and trout I’m pretty sure I’d love this! Especially when it’s flavour is so natural! I posted something here an hour ago but somehow it’s not here. There must be an issue with my phone. Anyway, this is a nice simple recipe but from the ingredients I can tell it’s full of flavor. I’ve never tried this fish before, I’ll have to locate it and make your recipe. Yes I did get your message and no worries. Have a great day! Nice recipe… I love fish! Autumn for me is chestnuts and mushrooms! 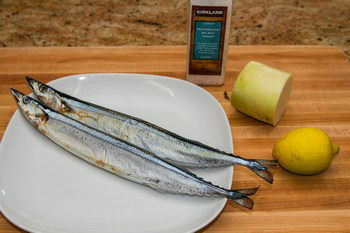 By coincidence, I had a pack of saury in thawing in the fridge this morning we had purchased at an Asian grocery. I’ve never cooked it before so was thrilled to find your post! We cooked it following your instructions but we didn’t have daikon, so I improvised with horseradish. The first few bites of meat were really tasty with a nice smokey flavor, but once we starting getting closer to the bone (and the guts) we definitely experienced the bitter, somewhat metallic taste. We’ve been trying to eat more fish and odd bits, and recently tried brains and eggs. That dish left the same metallic bitterness in our mouths, which is very interesting to me! Are you able to find this fish fresh in the states or was your fish frozen too? And thanks for sharing your recipe – perfect timing! Love the look of those grill marks! And such fantastic flavours as always! I’ve never heard of sanma, but they look rather nice. I really like their shape. Such a nice, simple recipe too. Like some of the others, I’ll pass on the guts (though I never bother to devein my shrimp, and they’re the guts – weird, huh?). Fun post – thanks. You are such an adventurous eater. I have always drawn the line at guts and I don’t eat bugs either. The fish looks fabulous on that plate, Nami! You need to write a photo book. Hi Maureen! Yes, I’m aware of “database connection error“. Usually it works when you “refresh”. It’s very frustrating. My hosting server cannot hold more than certain number of traffic at a time, which is why we’re getting this error message. We’ve decided to move to a new server soon. Hopefully this issue will be solved after migrating. Thanks for letting me know! 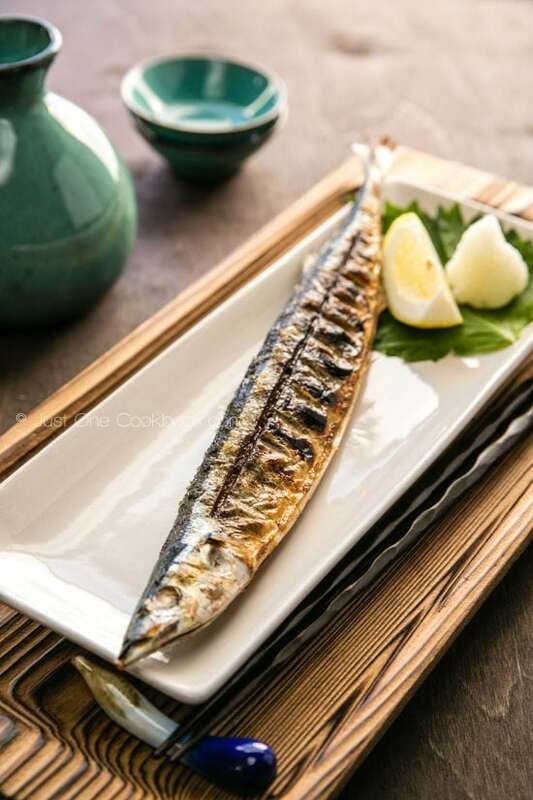 My husband likes to cook using the grill, and he is very exited when it’s about fish, of course we never tried Pacific saury, but I think we can replace with another kind of fish, living in the coast is very esy to find one. Hope you are having a fantastic week Nami! Nami, you have given us a delightfully simple recipe of a fish only few of us have accessed. I remember having it but don’t know where 🙂 ! Since it seems to be a Pacific fish, could have been oneither side of the Pond :D! Methinks more is at stake: Japanese so care about the quality and freshness of their produce: I do think many fish just out of the brine would fulfil the requirements!! What a lovely fish Nami and grilled over the coals must be delicious. Such a simple and wonderful recipe 🙂 I have never heard of this fish. I love your photos, they’re so nicely styled. Sanma is quite popular in the Japanese restaurants here in KL too, yours look so nicely grilled. that looks delicious, Nami. and a really simple garnish, lovely pics, excellent. Nami, I bet the fish grilled on a real grill tastes heavenly! I wish I had it… I also wish I could taste sanma (I have never seen it here apart from frozen and frozen delicate fish is not good so I never buy it), but who knows maybe one day I’ll see it in my big fish shop. You know what I would definitely eat in this fish? The tail!!! I love crunchy grilled/fried tails. Your posts are so frequent and such a high quality, I cannot understand how you do it… Congratulations! You forgot to mention one thing – the fish sells here (in CT at least) for $2.99/lb. A true bargain! Grilled fish is always on top of my list, but got to say that I never ate sanma. I saw it actually last weekend in the market place, frozen though but didn’t know what kind of fish it is so we got sardines. Will get it next time just to try it. Pics look great, very tempting! You have grilled this fish to perfection! Better than those serve in restaurant . I didn’t know that fish is called pacific saury. I have not seen sanma in Japanese market here this Fall yet but I hope I will find one soon. This look awesome! One thing that we as cultures have in common is that we too eat a lot of fish. Greece is surrounded by sea just like Japan and fish was and still is a fundamental part of our nutrition. We eat it in many ways but the most common one is to salt it and throw it on the bbq. We remove the entrails always. I have never heard of this fish before and I don’t think we have it in the Mediterranean, but it certainly looks very appetizing and I would be more than happy to have it on my table! 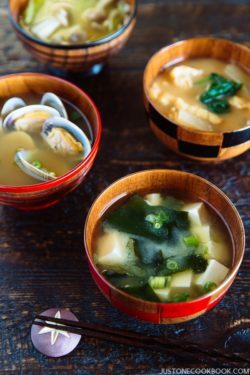 I loved learning what foods the Japanese associate with fall…I’m always in the mood for mushrooms and fish 🙂 Not sure about the chestnuts! I love that your hubby has mastered the grill…what a delicious way to enjoy fish. 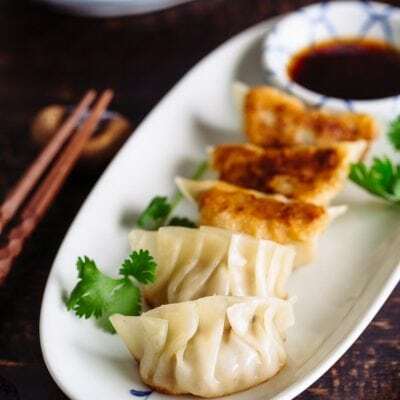 I’d love this one for dinner, Nami! These grilled fishes are perfect: light and easy to make! Another childhood favorite! My mom used to make this all the time! I loved it but there were way too many bones in them! Fish is always my favorite thing to order when we eat out. I would love to try this Grilled Sanma but I can’t believe someone would eat the guts. I bet my boys would do it! The fish looks so flavorful! I love fish and this looks fabulous. I am squeamish though so I’d probably forgo the guts. But I wish I was fearless so I could experience more from a cultural perspective. I figure if I’ve come as far as to be okay letting my food touch on my plate maybe one day I’ll get even more adventurous and eat food from other cultures the way it’s meant to be eaten. In other words, I’m a quiet baby and need to get over it. Lol! Fish, mushrooms and chestnuts – That is a definitely an interesting combination of fall cravings. 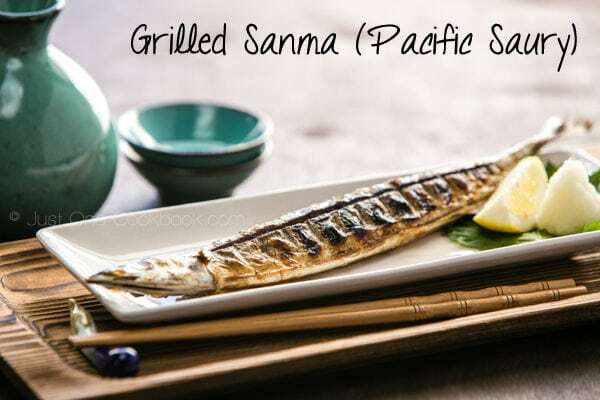 🙂 Your grilled sanma sounds very exotic and extremely tasty. I can certainly see how the charcoal grill would add a quality to this that you can’t get in the oven. Great decision to grill. 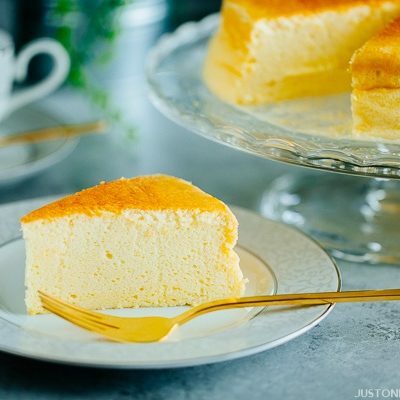 Thanks for sharing this wonderful recipe! Oh my Nami, I might be too chicken to try the guts. But I’ve never had this fish and sure would like too. 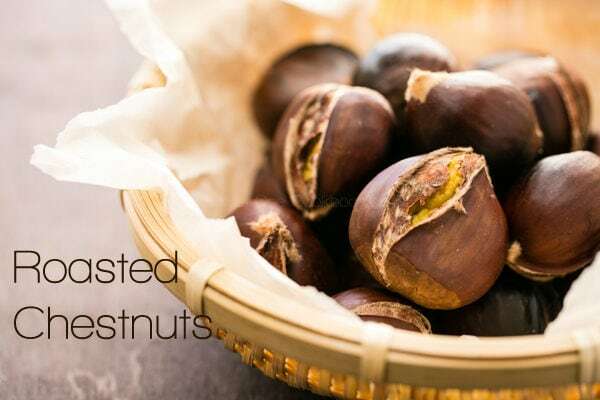 I’m ready for chestnuts too and all the fall goodies. Hope you are having a great week my dear. I’m ready for fall, bring it on. Oh Nami, it’s been a long time since I had this fish. My mom used to grill it for us often and I just love how this fish smells when grilled. For some reason it’s not popular nor available much in the market. Gorgeous! I will survive living in Japan since I love fish so much. That’s the only thing I can eat daily til I die, lol. Thanks for sharing this, now I know what shioyaki is. Yum! and I will try your non-charcoal grilled fish. This fish sounds so delicious, Nami! I love BBQ’d fish. So intriguing the way you prepare it, I’d love to give it a try! Your pics are fantastic, as always! 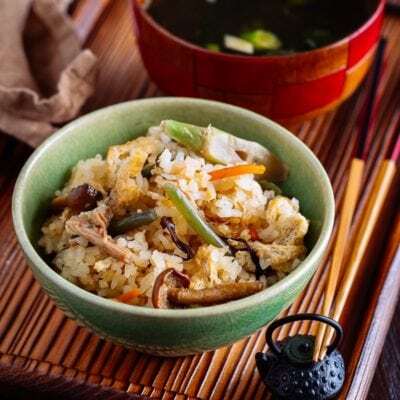 Nami, another wonderful griiled fish recipe – this looks so amazingly delicious! 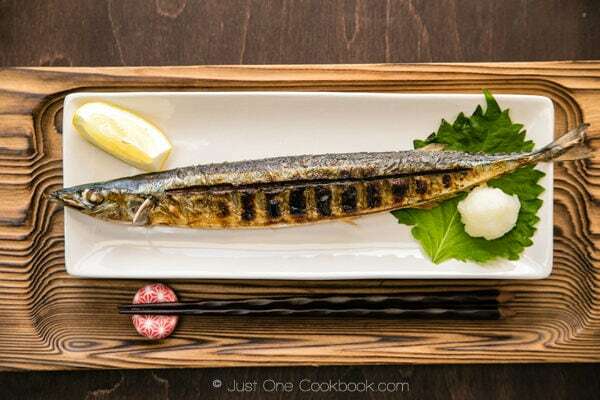 I have never heard of “sanma” before – I love to learn a lot of new facts of Japanese cuisine, especially the fish recipes have me wanting to master some of your terrific recipes – so much attention to deatils in the pictures! Another delightful visit to your blog! Sounds so full of flavour done on the grill. Can just about smell it from Paris! I’m not big on fish, I like it, but it’s not my first choice…however, if you served me this beauty, I would eat it in a snap! Looks amazing! Hi love! You may have already received this comment…I don’t know if I submitted it the first time! But I just love the thought of all those fall flavors (chestnuts, mushrooms, and fish). 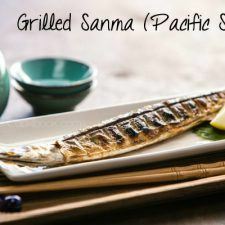 This grilled sanma looks beautiful! Thank you for sharing!!! it looks simple and very similar to how we cook fish in the Philippines. The only difference is the daikon on the side, which i also learned to love while living here in America. Great autumn dish Nami. Have a great week! 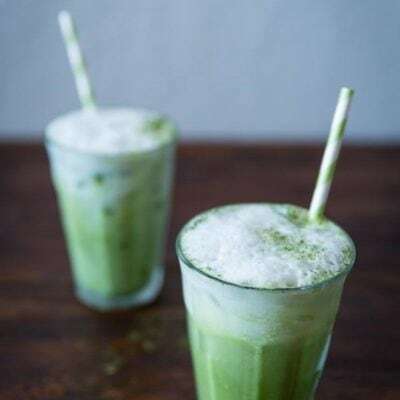 Hope this isn’t a duplicate comment, I’m not sure if the first one went through.Your cravings are so much healthier than mine and I could surely learn a lesson from you. This dish looks fantastic. 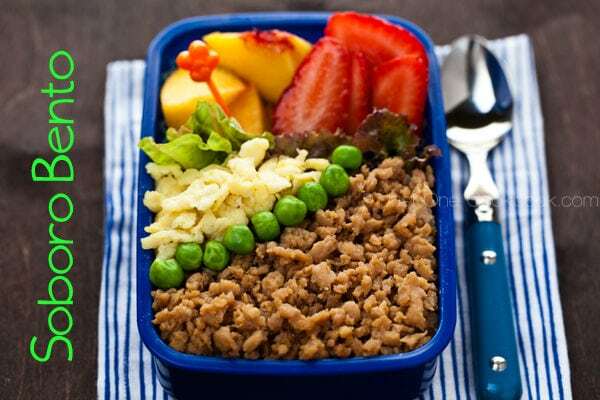 Looking forward to your Bento post tomorrow. I never ever grilled a whole fish like this, must try sometime. And this Daikon with soy is another thing I must make. I am so impressed with the simplicity of this dish as well as the incredible amount of info you’ve conveyed. I love learned about your authentic preparation. I have daikon in my refrigerator right now. Looks like I need to buy some fish too. Interesting to learn about your autumn flavors. Doesn’t matter to me if pumpkin isn’t involved–this sounds delicious! I think you have absolutely nailed this recipe! That last photo is stunning and it looks better than in many Japanese restaurants too. I’m not sure if I have seen sanma at Sydney fish markets even though we have such a huge variety of seafood. 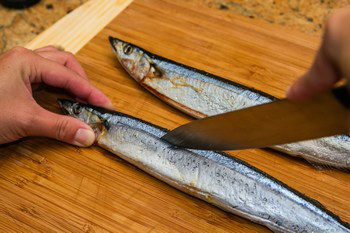 I prefer sanma to saba as I find it can be a little fishy at times if not cooked prepared and cooked properly. 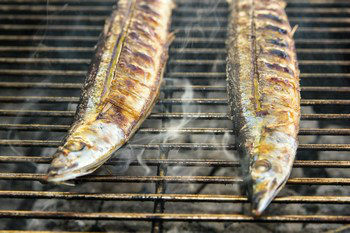 This is one of my all-time favourite Japanese grilled dishes and you have inspired me to grill sanma for my next BBQ. I can think of so many beautiful white wines to go with this dish too! I wondered what this fish was..have often seen at my Asian market. Now I know what to do with it! It looks so beautiful Nami. Never herd of this fish, but it looks it has tasty meat. The bbq fish realy nicely done and presentable-love it! So funny that the fish is season being a autumn sword fish. It looks lovely and nice way to prepare it. Oh, I love this. Need to make my way to the Japanese market (Mitsuwa) soon. I’ve never heard of this fish before, not sure if I can find it around here. 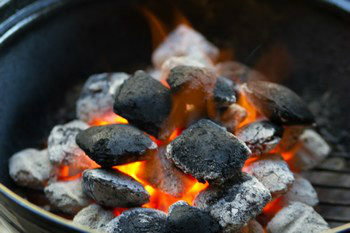 I love the idea of charcoal-grilling fish! Too bad I only have an oven and a gas grill. I’ll bet this fish was amazing. The flavor a grill imparts to food is simply mouthwatering. Grilling is a favorite past time in our home. We have a covered deck so are fortunate to be able to grill year around. Especially since Seattle spends much of the year in the rain! Oh Wow! the fish has been grilled to perfection and is so nicely charred! Coming from an island where seafood is so fresh, we learn to eat everything including the eyeballs (yum). The bitterness, I must agree, takes an acquired taste. I remember a very authentic Japanese family restaurant called Yokohama here a while ago where they made this dish super well. It sounds simple to make, but I haven’t had another like it again since the owner moved back to Japan. Every other one I’ve had just didn’t measure up to it. Yours look super good tho. Very much like how they served it, with a slight crisp to the skin. I am seriously missing this right now! What a beautiful fish! I love the presentation! It looks amazing! This fish looks so good, especially all charred in its whole form. Very nice! Nami, this is a beautiful grilled fish, love charcoal grilled anything…I will have to look for it. I have grilled rainbow trout with the heads on, but no guts! 🙂 The daikon radish would be good with fish! This sounds and looks delicious, nothing better than truly fresh fish. I haven’t heard of this kind before but it does look good ! 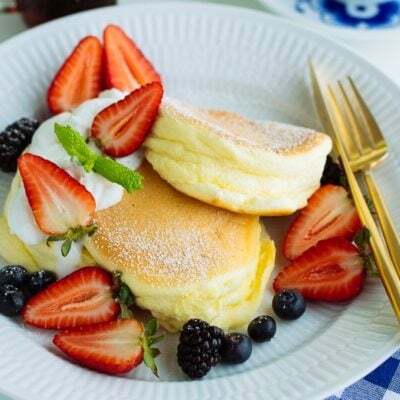 Beautiful dish Nami! The grill marks came out perfectly and there’s such a beautiful sheen on the fish. Hmmm..about the guts…didn’t know you could eat those! Not sure if it’s something I could ever try…don’t have the guts to try guts..lol. never seen any of the here…. Thank you for the simple instructions! I’ve always wanted to grill sanma at home. 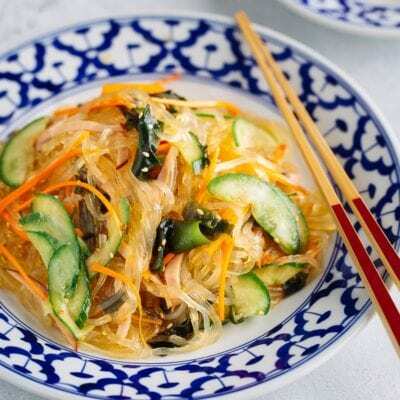 What (veggie) side dishes would you recommend, aside from the daikon? Hi CM! Thank you for your comment. This is one of the easy recipe and I hope you enjoy sanma at home! Hi Nami, this is my absolute favorite. There is no 2nd option if this is on the menu. I will have to give this recipe a try. Thank you so much. I like to put some soy sauce on the fish instead of salt. My mother did it that way. This is a good tasting fish and reminds me of growing up and visiting my relatives in Japan! Wanted to add… just bought some from my local market. Sanma from Japan! Cleaned them and my hands smell like fish! I don’t mind. So delicious soon! p.s. sorry about my late response! Thank you so much for all your recipes. They inspire me a lot ! I have one question concerning grilled fish ! For some recipe you use sake and salt, but for some recipe, you only use salt. Could you precise when if we need sake according to the fish ? Or you can do both wah for every kind of fish ? Hi Suzanne! 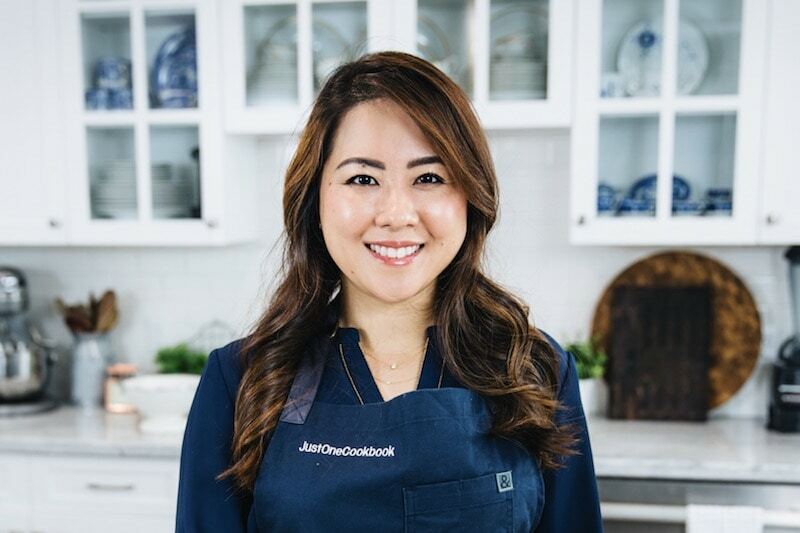 I’m happy to hear my recipes inspire you. 🙂 You have a great question! In general, salt is used to remove the fishy smell. Usually use 2% of fish’s weight (200g fish, 4 g salt). 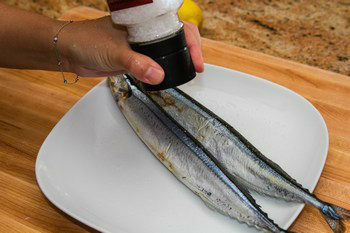 Salt draw the moisture from the fish and wipe off the moisture with paper towel. Now sake can remove/mask the odor too, but it also brings out the umami of the ingredients and make the fish flesh “plump” (that’s how we express in Japanese).